I used to be really enthusiastic about the Week of prayer for Christian unity (18th-25th January), especially in my twenties, I would almost jump for joy at the thought of it. I would not be a Christian had there not been for both Catholics and Protestants who influenced my journey, nor would I be who I am today without those influences. 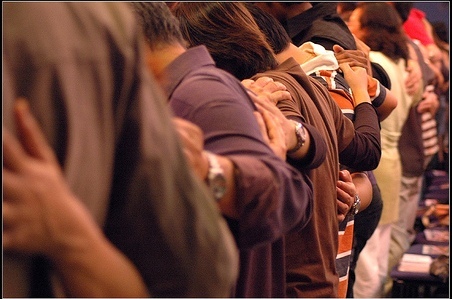 Because of that, prayer for unity has been my daily bread all throughout my adult life. Through my Baptist friends in Croatia, where I’m from, I learned of the importance of making a commitment to Christ, of saying ‘Yes’ to God, and of making my prayer more personal, more real. From Catholics I learned of the need to belong to a Church community, and that while personal relationship with Christ is important, there is more – God wishes more than a personal relationship with us, He wants to have an intimate relationship with us. But then a few years ago my enthusiasm for ‘ecumenical matters’ was challenged because I saw that progress on this journey is sometimes very slow. Differences that could enrich us sometimes unfortunately divide us, and it is easy to get discouraged. I went through a year where I did not attend any of the ecumenical gatherings, and I did not go around visiting different Churches, as I sometimes would, rather I withdrew into the silence of not-doing and prayed to somehow be able to recommit to this call. Since then, I decided to focus more on Jesus and His desire for unity rather than on the reality of our Churches, and to rely on the fact that if He wants unity so strongly so as to make it His dying wish, it must then somehow be possible. I don’t need to understand how. Jesus prayed for us, and we are still gathering fruits from that prayer. Whenever we pray for unity between Christians we join Jesus in this prayer, we accompany Him into the garden like Peter, John and James did. It is a testament of perseverance in prayer that this week of prayer for Christian unity has been taking place regularly for over 100 years now. However, the very fact that this week exists highlights that we have ‘a problem’, that we are not yet united, as Christ would wish us to be. There should be no special ecumenical gatherings nor special services where we gather together. It should be normal that we come together, it should be part of our daily reality, and I know that for some of you it is, but on a global scale unfortunately we are still not united, not enough anyway. ‘Is Christ divided?’ is a theme that Canadian Christians chose for us this year. We know that Christ can never be divided, and we are each in His heart, individually and each Church too, in His heart we are united, but our reality often does not show that. I think it is not a problem that Churches are different, perhaps that is even good because diversity of Christian expression can be enriching. But unfortunately some of our differences happen to be divisive. Paul said to the Church in Corinth I hear “that there are quarrels among you” (1 Corinthians 1:11). This sounds familiar as sometimes there are quarrels among us as well, especially when talking about the ‘hot-button-topics’. I must say that those make me feel very uncomfortable and I often don’t know how to address them. And I actually wonder how we will ever find unity in some of them; unless we allow each other to remain different. When we encounter those we realise there are gaps between us and it can be hard to stand in the gap because that’s where we encounter the pain of our disunity. I don’t think that any one of us can bridge those gaps, only Jesus can, Jesus is the bridge, but we as His followers need to be bridge-builders. A few years ago I heard that ecumenism was in winter; I am not sure if this is true, but even if it is – winter is important. There can be no spring or summer without winter, winter is a time of preparation, of healing, of restoration. Recently Pope Francis said how “we have not yet managed to take necessary steps towards unity between us and perhaps the time has not yet come”. It made me think: “Perhaps the time has not yet come” – I never thought of it this way. God takes time, and from my experience He does so especially when something is important to Him; I wonder whether at least sometimes it is true that the more important something is to God, the more time He will take with it. That is very hard for us to comprehend, as we would like to rush things, I know I would. But throughout ‘the times of waiting’, the in-between times, the Holy Spirit is active and there are fruits on the way that maybe we would miss otherwise. I believe that for God journey is important as well as the goal; maybe we are not yet ready to receive the fullness of unity, and whatever God is doing in each of us and in each of our Churches at this time, is important too. Sometimes we do not see God’s work fully, it is hidden from our eyes, but that does not mean that He is not active. We cannot rush spring into winter, seasons have their natural flow too. I would like to invite you now for a moment to reflect on one or two things from your own tradition through which you experience God the most intimately, something that if you could you would like to share with all other Christians. (pause here for a moment to think before you read further) Or maybe there are things in another Christian tradition that you wish your own Church would emphasise more. Until we are able to share those freely, our unity will be incomplete. God wishes to heal our divisions; in Isaiah He said “I have seen their ways, but I will heal them” (Isaiah 57:18). Sometimes in the Gospels when Jesus healed He would ask “what do you want me to do for you?” but I think that here when we pray for Christian unity we need to reverse the question, “Lord, what do you want me to do for You?” Because the Church in all its branches is ‘the body of Christ’, when we allow our divisions to be healed we help Jesus’ wounds to heal as well. I believe that our disunity is painful for Christ, it is heart-breaking really. Also our disunity is a distraction because our job is to build the kingdom of God, and together we could do that much better. Recently I was told that from God’s perspective “delay is not a denial, not even withholding” and because “our lives are so linked up with those of others, so bound by circumstances” that delay has to be sometimes; if God would let our prayers always have an instant fulfilment, it might “in many cases cause another, as earnest prayer, to go unanswered”. * This may be applied to our quest for unity. If there seems to be a delay, God knows what He is doing. Maybe He is preparing us for this gift of unity, let us prepare ourselves too. Amen. you are here: Church's Ministry of Healing Ireland > Thoughts > Is Christ divided?